BEIJING, April 8 (Xinhua) -- Chinese President Xi Jinping on Sunday expressed the need to improve global governance during his meeting with visiting UN Secretary-General Antonio Guterres. Xi said that there are a lot of problems in the world, which come down to the issue of international governance systems and capabilities. "We need to keep pushing for and improving global governance to deal with this challenge," he said. "Whether it is domestic governance or global governance, we must have people's sense of fulfillment as the objective and continue to provide confidence and expectations of stability for the people," he said. Xi said that the development China is pursuing should be with high quality, and a people-centered development vision should be put as a standard to measure the development. "We maintain that all countries, big or small, are equal, and we also advocate that major countries must shoulder their due responsibilities," said Xi. The essence of multilateralism is to seek consultation and cooperation among all countries, and cooperation among major countries should be first, said Xi. "We are willing to share China's development opportunities and experiences with the world, but will never impose our own path, models, and theories on others," said the president. "Everything we do is for people's happiness and national rejuvenation, and to seek common ground for the world," he said, noting that China's efforts to advocate and promote the Belt and Road Initiative are also aimed at seeking synergy of development plans among various countries, forming a common development momentum and increasing confidence in a better future. Xi also stressed that it is a basic policy of China's diplomacy to support UN's role and safeguard the world body's authority and stature. Guterres congratulated President Xi on his recent re-election, saying it is of historic significance for China. Guterres said that it is believed that China will exert greater influence in international affairs in the coming decades. The world today faces many peace and development issues that need to be resolved through global cooperation, and the role of multilateral institutions needs to be strengthened, he said. 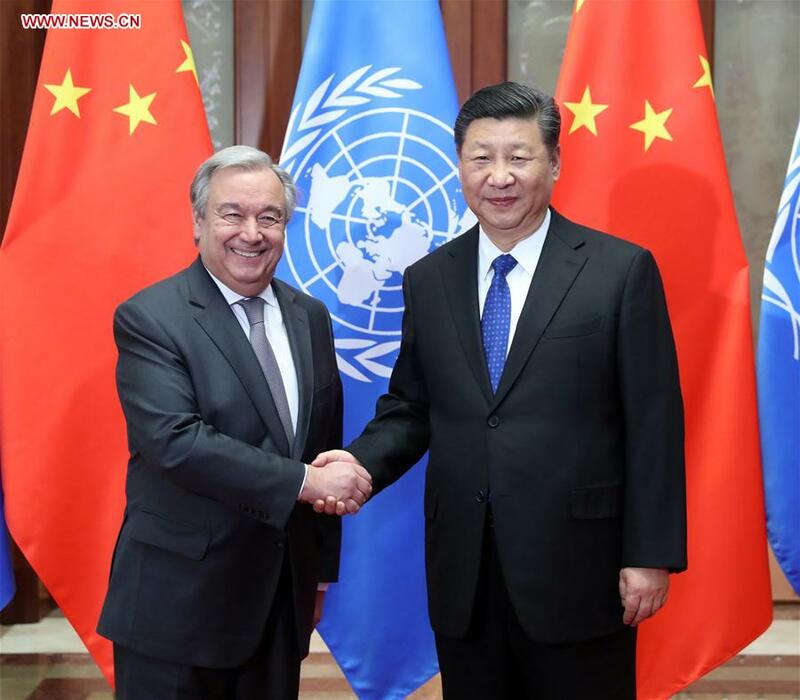 Guterres thanked China for its long-standing support for the cause of the United Nations and China's important role in multilateral institutions. China has become the most important pillar of multilateralism and an indispensable, trustworthy force for world peace and development, he said, noting that the cooperation between the United Nations and China is very important. Guterres also agreed on President Xi's vision on building a community of shared future for humanity, and the initiatives, including the Belt and Road Initiative, put forward by China in aims to realize common prosperity. The two sides also exchanged views on global and regional issues of common concern. Guterres expressed gratitude for China's important role in pushing forward talks to work toward denuclearization on the Korean Peninsula. After his stay in Beijing, the UN chief will travel to Boao, Hainan Province, to attend the Boao Forum for Asia Annual Conference 2018.